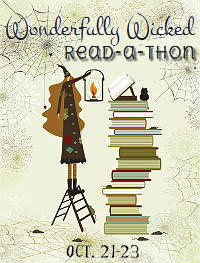 The Wonderfully Wicked Read-a-thon was hosted at Kindle Fever and My Shelf Confessions for the weekend (October 21st - 23rd). With Halloween coming up, I decided to read only books from the horror/thriller genres. Since it is now the 24th on my side of the world, I have decided to do a wrap-up post. I finished reading five books; i.e. one more than my set goal. This was my first read-a-thon and I have to tell you, it was a huge success. After reading five horror novels back-to-back, I can't look in mirrors, be alone in stairways in my own house and sleep with the lights out. My eyes are so swollen, I have had a number of people asking me if I was sick for the past couple of days. Now when I close my eyes, I see words floating around in my head. And I am so tired that I am afraid that if I let myself fall asleep now, it'd be impossible to ever wake up. I love this feeling! I am looking forward to taking part in many more read-a-thons.